Eighty-year-old Budda Muthyalu, a Lambada tribeswoman, does not know how much a cubic metre is or how much Tan Brown granite fetches in the market. All she knows is that quarrying for the stone near her hamlet in Hosnabad block of Karimnagar district spells disaster for her people. Karimnagar is known for its reserves of Tan Brown, a black-brown granite speckled with brownish-red mineral crystals. It is used in flooring and kitchen counters; one cubic metre of the granite sells for US $450 (Rs 20,000) in the international market. Its rising demand has led to indiscriminate quarrying. The 150 Lambada families living on the fringe of Mirzapur village depend on a nearby hillock for a living. “You know Manyagutta hillock is full of big seetaphals (custard apples). We also get honey in abundance. We sell them in the market,” says Budda Devuli, Muthyalu’s neighbour. “What would happen to us if the quarry people raze our hillock too?” they ask. Their fears are not unfounded. The hillocks that dot the region are reserves of granite and many have been razed. 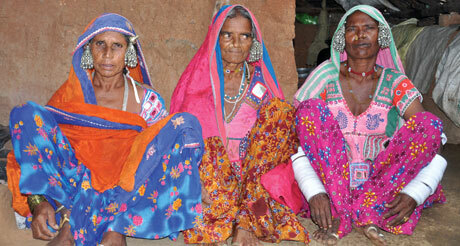 “Stone quarrying has affected at least 200 villages in 25 mandals (blocks),” says T Jaganmohan Rao, writer and activist. Karimnagar block with 81 quarries and Gangadhara block with 61 quarries top the list of blocks having maximum quarries. Odyaram village in Gangadhara alone has 39 granite quarries. Deep, crater-sized pits can be seen where hillocks once stood. The quarry waste is dumped in the open fields. People affected by quarrying include fishing communities like the Thenugus, shepherd communities like the Gollas and tribal communities like the Lambadas and Mudirajus. In Nandagiri village in Pegadappally mandal, 200 Mudiraju families lost their livelihood after Thattegutta (honey hillock) was razed by quarry owners. “We used to get honey worth Rs 3 lakh from the hillock each year,” says Mala Enkati, a resident. The State Mines & Geology Department, however, cares little for the plight of people like Muthyalu. It has granted 634 quarry leases in Karimnagar—364 for granite and 270 for stone crushers; these are spread over 20,234 hectares (ha). About 150 quarries are functional; many more may start operations any time as they have leases for 20 years. 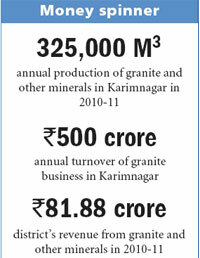 Granite production in Karimnagar increased in 2004 when China started importing it in large quantities in the run up to the 2008 Olympics. Now many Asian countries import it. The monthly production of granite in the district is about 20,000 cubic metres (see ‘Money spinner’); China consumes about 80 per cent of it. “Tan Brown is moving very fast in the international market because of its high quality, availability, and relative low cost,” says P Sridhar, managing director of PSR Granites. It is one of the 10 big companies that control 40 per cent of granite production in the region. The hillocks in Karimnagar host a variety of plants and wildlife, perennial streams and natural tanks. But in the revenue records they are classified as “unassessed wasteland”. This makes it easy for companies to obtain leases to quarry them. The hillocks are surrounded by fertile paddy and maize fields and mango orchards. Destruction of the hillocks would lead to acute water crisis say residents. The hillocks are along the Manair river, the lifeline of Karimnagar. Quarrying in the region is silting the river, its tributaries and natural tanks on which people depend for their water needs. There are 3,700 tanks in 43 blocks in Karimnagar West division. Many of them have dried up. Quarrying has also disturbed wild animals. The hills are home to bears, wild pigs, hares and peacocks. The forest department records show 12 instances of humans getting killed and 39 persons being injured by bears in the past 10 years. The population of bears in the district could be about 5,000, says Priyanka Varghese, divisional forest officer of Karimnagar West. “It is time the government initiated an environmental impact assessment (EIA)” says S Sujatha, assistant professor in the department of sociology at the Sathavahana University in Karimnagar and convener of the civil society group Telangana Bhoomi Rakshna Sangham (TBRS). She says the quarries violate environmental and mining laws. TBRS has approached the Supreme Court’s Central Empowered Committee to check quarrying. The state government, however, is pursuing an aggressive mines and minerals development policy. Its mines department has identified the mineral sector as one of the growth engines; certain minerals like granite (classified as minor mineral) are recognised as focus minerals. The state’s revenue from minerals in 2010-2011 was Rs 2,171 crore (Rs 903 came from minor minerals); the target for this fiscal year is Rs 2,995 crore. The state’s Minor Mineral Concession Rules of 1966 are silent on the environment and livelihood of people. “Leases are granted based on mining plans submitted by applicants,” says B V R Susheel Kumar, director of the mines and geology department. The Union environment ministry does not prescribe consent of the gram sabha, public hearing and EIA studies for minor minerals, says Kumar. The state pollution board’s permission is needed only if the lease area exceeds 20 ha. So it is the mandal revenue officer (tehsildar) who generally inspects sites and issues no objection certificates (NOCs) to quarries. There are instances of them issuing NOCs even in protected areas. The proposed quarry area of 4.9 ha in Kachireddypally village in favour of V S Granites is in a reserved forest. The forest department is fighting a case against it in the high court. The Devuligutta hillock at Narasimhapally in Gangadhara mandal, for which 13 applications were received, has an ancient fort and a temple dating back to 320 BC. “We are fighting against leasing the hill; we have petitioned the high court,” says K Kirthi Kumar, a retired engineer whose family was custodian of the fort and the temple at one time. Villages like Annaram in Manakondur mandal and Myadampally in Malyal mandal, which initially resisted quarrying, are now divided. In most villages, quarry owners have won over sarpanches (heads of local bodies) and panchayat (local body) council members, says 80-year-old Pakala Ramanna Reddy, a retired teacher, fighting quarrying the past few years. Every village has a posse of youngsters supporting quarry owners. They get liquor and money. People who protest are harassed, says Reddy. In Myadampally, the police cracked down on women protesters in February. Thirty-four of them were sent to jail for 21 days and charged with two to three cases each. “We are continuously threatened. Many are scared to come forward now,” says P Nirmala who led the agitation. In Annaram, 20 people are facing multiple criminal cases. 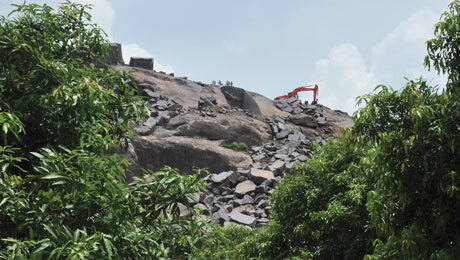 On the other hand, quarry owners like Sridhar say they are blackmailed by panchayat members, officials and politicians. The quarrying continues as Tan Brown makes a few people rich and communities like the Lambadas poorer.